Life with Lucie & Ella: Oh, Christmas Tree! On Sunday night, we headed out to a local farm to get our Christmas tree. They sell Monterey Pines that they grow on-site as well as some that they have shipped in from Washington, namely Nobles, Grand Fir & Douglas Firs. Growing up, we always got a Douglas Fir -- probably because it is the cheapest kind. So for me, I'm happy with a Douglas because it is tradition...and it's easier on the budget. Unfortunately although it was still early December, they were out of Douglas Firs except for one sad, brown specimen. I mean, it was pitiful -- they shouldn't have even had it out it was so bad. We were a little disappointed since the Grand Fir was a step up in price. I guess the salesman could sense our hesitation, saw that we were a growing family and let us have a $10 discount on a beautiful Grand Fir. I think Ella's highlight of the night was when the man gave her a candy cane. Yes, she's easy to please. Afterward we headed home to set up the tree and have some hot cocoa and cider. Ella was enthralled with all of the ornaments and very anxious to start the decorating. We started out with the bell ornaments and her first instinct was to put them all in the same spot on the tree. Of course, Mommy went ahead and fixed that pretty quickly. 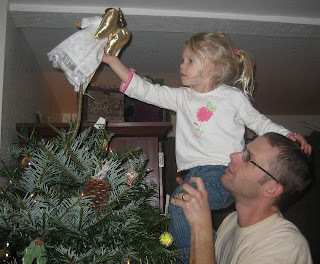 We also let Ella do the honors and pick the angel from my vast collection to put on the top of the tree. Later, we had a very good laugh when we rediscovered the Dancing Santa. A few years ago, my mom bought us one of those animated Santas who dances and plays a saxophone. Last year Ella was terrified of it. I vaguely remembered that and wanted to see how she would respond this time around. It was pretty much the same. Brett brought out the video camera and recorded some of her minor terror for posterity...while mean old Mommy & Daddy laughed hysterically. Ella realized pretty quickly that she wanted to go to bed where she was safe from the dancing Santa. I'd post the video, but it's on our real video camera and it's just too big of a pain to transfer to the computer. In the past couple of days, Ella's favorite ornament has been the Hallmark Wise Men ornament she got from the Fishers for her first Christmas. It plays music and I think that is why she is drawn to it. Despite my asking her to leave it on the tree, I'm constantly finding it elsewhere and hearing it's little tune. But, I'm happy that she is enjoying our decorations so much. You are a beautiful family! Love the belly shot in the background. One question: did you wash the tree?! No, we did not wash the tree. I know, Dad would probably be disappointed! But, there really wasn't a speck of dirt on it. It's really quite a clean and lovely tree...it should be for what we paid for it! When we used to buy the $20 Home Depot trees, we always washed them because they were so muddy. Great Holiday shots. The belly is great. 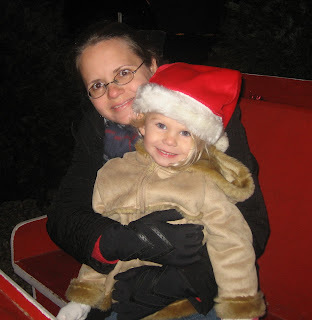 The pic in the sled is precious and letting Ella place the Angel... priceless! Thanks for sharing the event. Robby hosed our tree (fresh off a truck from Oregon, a Noble I think) off and shook it before he brought it inside. With no suggestion from Dad even! We ARE a freaky family!